Our April 23 meeting will be all about the Rotary Foundation. President Mike Mitchell has arranged for District Governor Kirk Reed to be our guest speaker to help educate our members as to the importance of the Rotary Foundation and to award Paul Harris Plaques (some from prior years) to Margaret Geis, Fred Dammeyer, Sam Loveless, Jon Matheus and Sam Carroll, as well as Paul Harris Plus Pins to Brianna McNeely (plus 1), Jonathon Lines (plus 4) and Derek Egeberg (plus 8)! 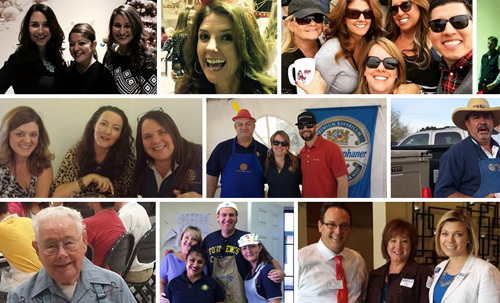 4/30 is the 5th Tuesday, Yuma Rotary will not meet for lunch however will have a social hour for networking at an off-site location yet to be determined. Yuma Rotary welcomes you to join us during our weekly meeting. Our guest presenter is Yanick Hicks, a member of Glendale Rotary who will provide an ethusiastic presentation about Becoming a Rotarian of Influence. Please join us as Page will lay out his budget and introduce committee chairman. Committee sign ups will also be this day. Please join us as Lisa Love and staff talk about their successful space educational program and their interest in creating an Air & Space Museum. Please join Yuma Rotary for a club assembly with President Page Misenhimer. Yuma Rotary welcomes everyone to our weekly meeting. Our guest presenters will be Shelly Mellon and Dr. Linda Elliott-Nelson who will share information about the Yuma Youth Town Hall program. Please join us as Tad Zavodsky provides information about the City of Yuma's Neighborhood Leadership Acadmey.